No matter where you are in the world, chances are you’re going to want some pizza. So when you’re on our mountain and you want a mountain of cheese and fresh toppings on a golden, hand-tossed crust … allow us to share the best places for pie in the sky. We know a thing or two about pizza, because we’ve eaten a pizza or two – you know, for the purposes of this story. Call it Research & Development. Call it enhancing the guest experience. Whatever you call it, don’t call it gluttony. That really hurts our feelings. Read on for our favorite pizzerias in Killington. Domenic’s is located close to Choices Restaurant, a little further back off the highway. 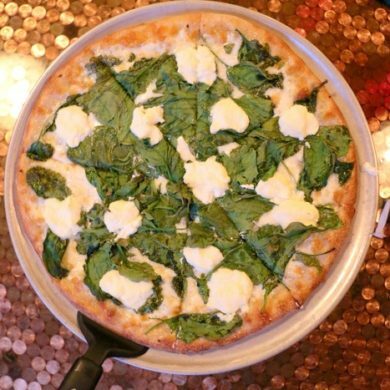 The upscale pizza joint offers indoor and outdoor seating, with fantastic views of Killington Mountain. The decor is ornate, quite different from everywhere else you can eat on the access road. It’s a cool vibe, the music more jam band than the 80s soundtrack found in most eateries around town. Domenic’s has a full bar with a high-end wine and beer list. There are about 15 tables inside, plus a 12-seat bar and another four tables with large umbrellas outside. The restaurant has a loyal local following and a steady stream of visitors. Our server told us they tend to have an early dinner rush when they open at 3 p.m., then another one later in the evening. Even during the season, they are only open for dinner. He did note that sometimes people have trouble finding them, since they are tucked a bit off the road. But once they do, they become regulars. Domenic’s got its start as a small operation, behind what was formerly a cafe. Steady growth led to the need for expansion around the same time the cafe closed, and Domenic’s took over the whole space. We tried the house white pizza, with mozzarella, spinach and ricotta, the garlic and ranch wings, and the signature dessert – a S’mores calzone. Everything was beyond delicious. Dough and sauce are made in-house daily, as they should be. All ingredients are super fresh. There’s trivia on Thursdays at 8:30 p.m., and Meatball Sliders every day from 3 to 5 p.m. at the beautiful copper bar. Domenic, the owner and chef, and his staff are more like a family than coworkers – extending that same kindness to everyone who walks through the door. The restaurant offers takeout and delivery, if you would rather enjoy a pizza from the comfort of your hotel room at Killington Mountain Lodge. While you wait for your pizza to arrive, check out the restaurant’s hilarious commercials here. This family-owned eatery specializes in hand mixed and hand tossed dough, using local, seasonal and sustainable ingredients – all at a great value. Open for lunch and dinner every day, they also offer take out and delivery service. If you need to get a little work done during your stay, the upstairs lounge has the best Wi-Fi of anywhere we’ve been. Plus, you can sit and type and EAT PIZZA. Do yourself a favor and start with the garlic knots. iPie is walkable from Killington Mountain Lodge. There are a few booths downstairs, and the second floor is the lounge. It’s a big open space, with windows on every wall, so you have an almost 180-degree view of the mountain. There are couches and big cushions to sit on, TVs and a table for kids to play. iPie offers all your standard pies, and then some inventive ones – like the Buffalo Pizza with chicken, blue cheese and wing sauce, which you can dip into ranch. Oh, I’m sorry, I just drooled on my laptop. Although we can’t ever get past the pizza at iPie, they do serve excellent salads, wraps, calzones and homemade cookies, for one sweet ending. Pizza in Killington? This is one slice of life you don’t want to miss.